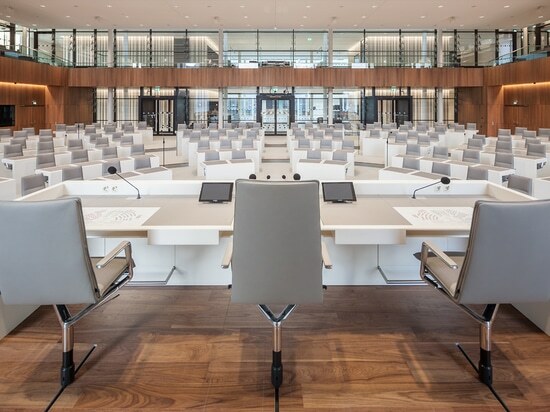 Stuttgart architects blocher partners translate the modern concept of democracy into timeless architecture at Lower Saxony state parliament – furnished with Wilkhahn chairs to reflect the same approach in the interior design. 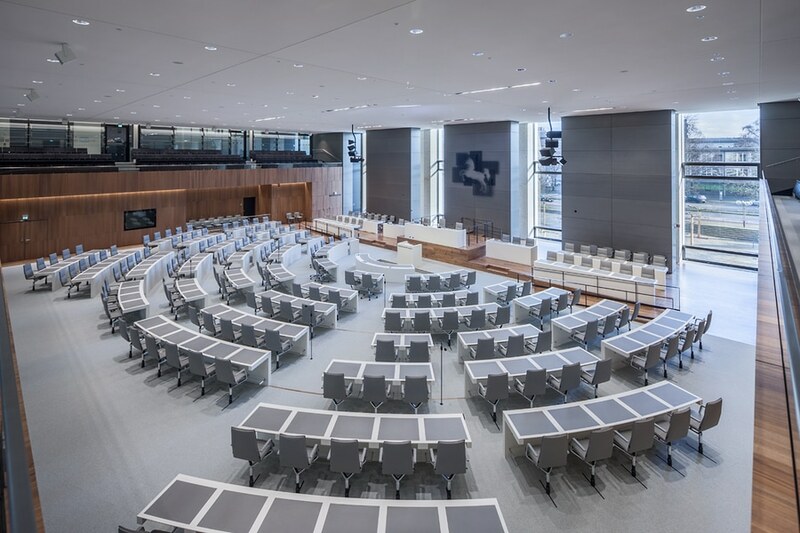 Stuttgart architects blocher partners sympathetically transformed the newly opened Lower Saxony state parliament building in the state capital of Hanover from a listed ensemble, consisting of the Leine Palace and Oesterlen Building, into contemporary architecture. 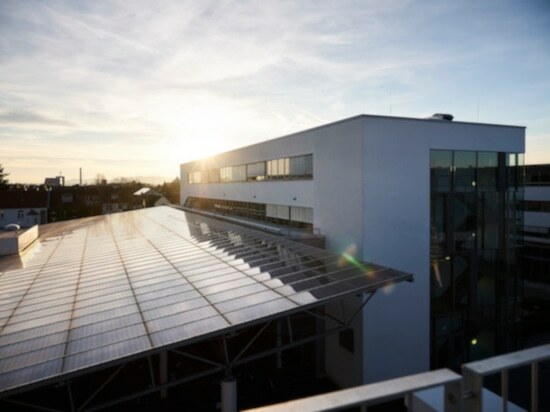 At the same time, they added a new internal structure to the ensemble that doesn’t just meet the highest technical standards, but due to the glass plenary chamber and central portico also translates the modern concept of democracy into timeless architecture. 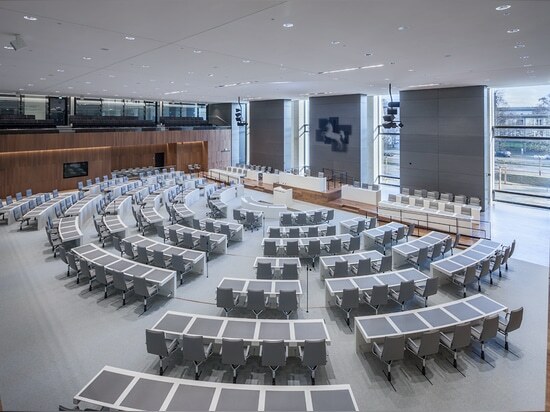 The plenary chamber is also furnished with Wilkhahn chairs to reflect the same approach in the interior design. The Lower Saxony state parliament building in Hanover is a spatial collage of different eras: it was originally constructed as a modest half-timbered building under Duke Georg von Calenberg in 1637 and subsequently extended. In 1817, under Georg Ludwig Friedrich Laves, the Leine Palace gained its classicist appearance that defines it up until today. 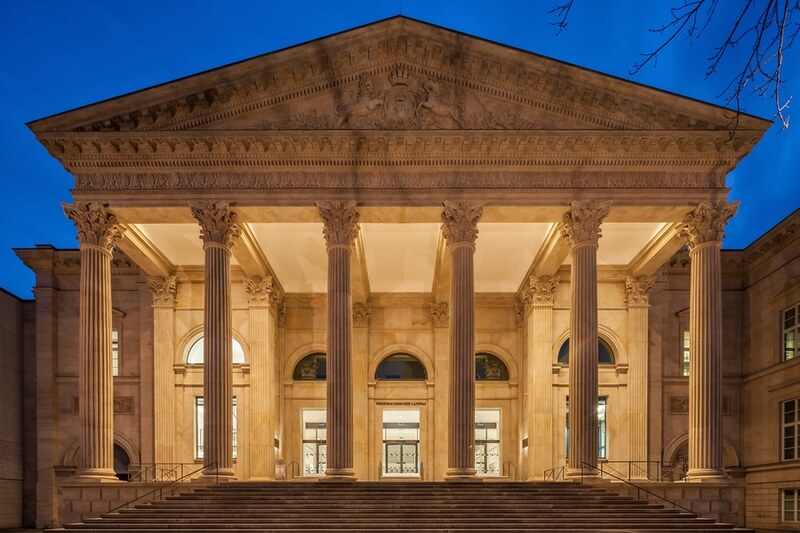 The building was destroyed in the second world war, but Hanover architect Dieter Oesterlen turned it into a parliament building with an added plenary chamber in 1962. The ensemble was considered an exemplary expression of the still fledgling German post-war democracy. 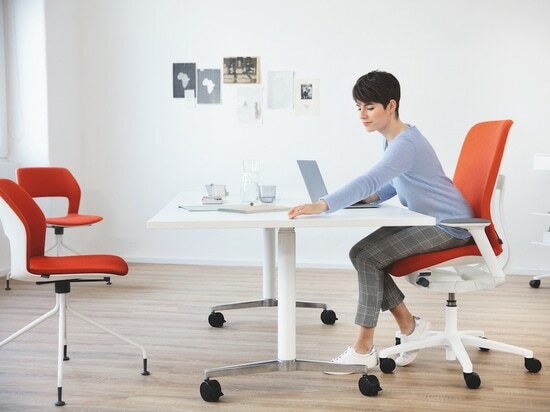 Around 50 years later, it no longer met the needs of a modern-day parliament building. 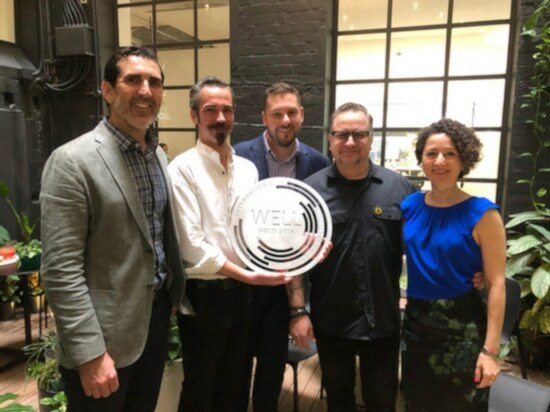 Following various competitions, it was the Stuttgart-based blocher partners architectural firm that won the day with a concept based on transparency. 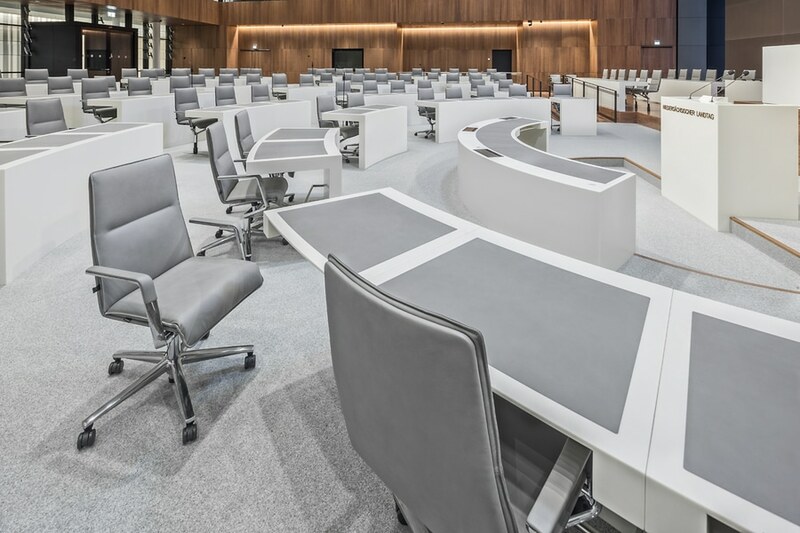 The remodelled state parliament building was opened by Germany’s president Frank-Walter Steinmeier in October 2017. 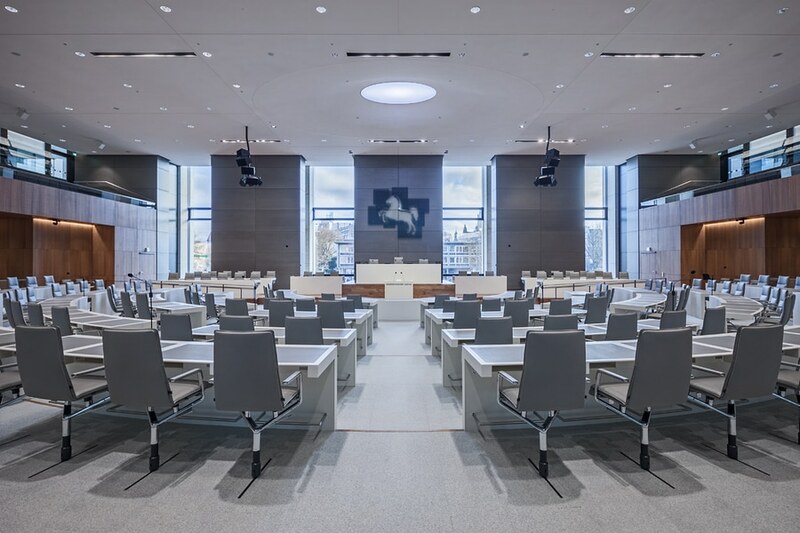 While the plenary chamber’s listed Oesterlen facade was retained, blocher partners completely gutted the inside of the building. The chamber’s panelling was also removed. 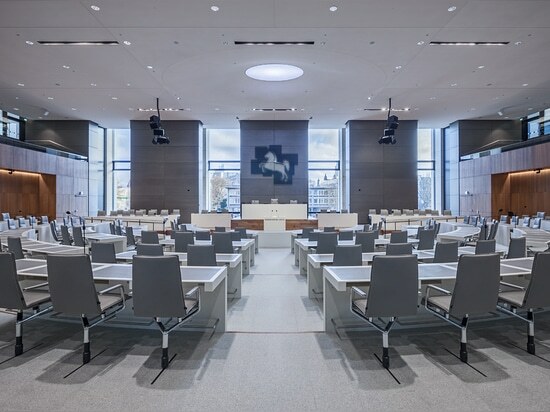 All technical elements such as filters, air conditioning or soundproofing components are now concealed in the chamber’s gently arched ceiling above the lectern. 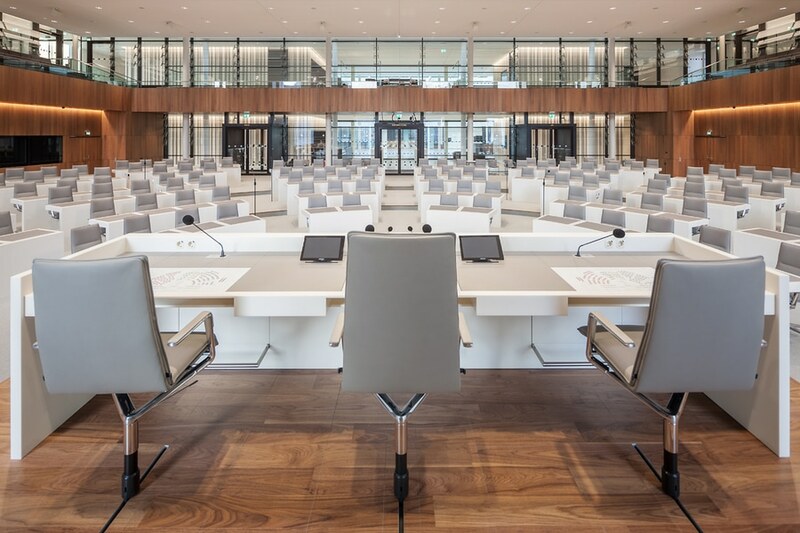 The members of parliament now have a view of the city from the plenary chamber and through the distinctive facade: the cityscape becomes a backdrop against which the speakers – with their backs to the government and presidium – speak to parliament. 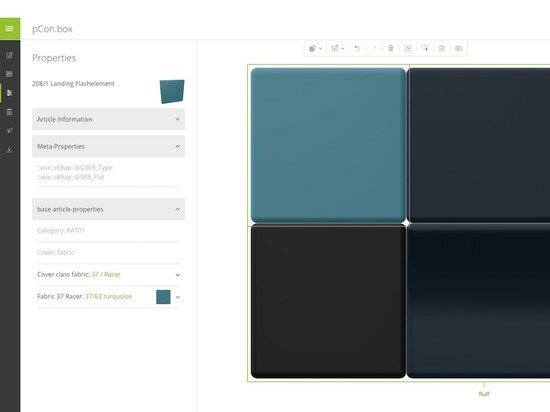 The colour scheme throughout the building is understated, but splashes of colour are created by using materials and emphasising linear elements. 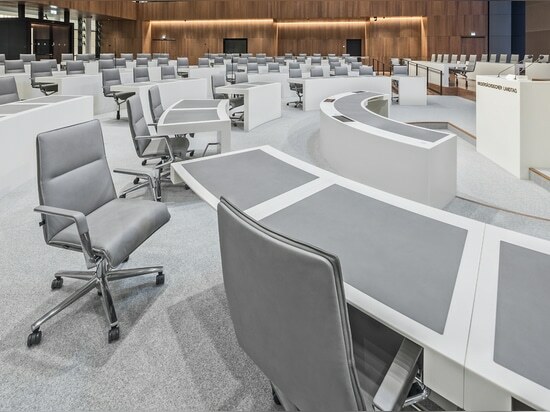 blocher partners highlight the semicircular area where members of parliament sit with a light colour scheme in various shades of grey. The heart of the chamber is lined with classy walnut panelling, behind which the press and visitor rooms are accommodated. 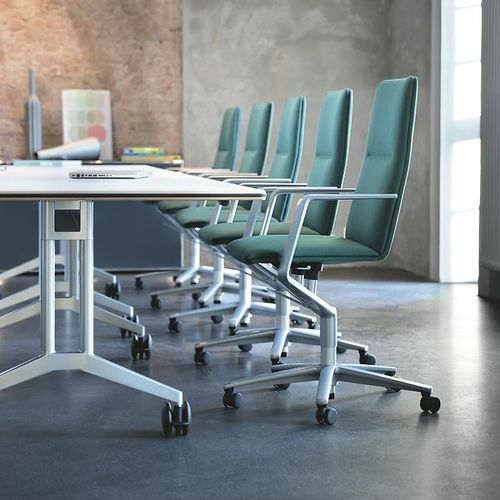 Micro perforations in the wood, free-standing wall sections clad with sound-absorbent metal panels and a light-grey carpet made of Kugelgarn® ensure the acoustics are superb. The speakers’ booths for soundproof recordings are located at the same level as the parliamentarians with the visitors’ galleries and press gallery with barrier-free access are located a storey up. 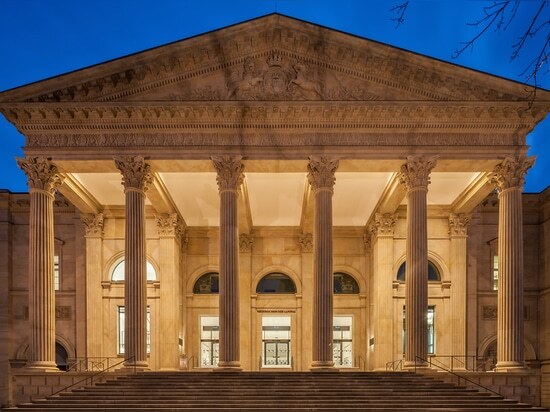 The new dazzling white portico acts as a central point of navigation and from here visitors can also watch what’s going on in the plenary chamber.